During the spring semester of 2012 researchers from the Center for Advanced Spatial Technologies (CAST) at the University of Arkansas, Fayetteville collaborated with the University of Arkansas Landscape Architecture Department to survey and historically document the cemetery of the WWII Japanese Relocation Center located in Rohwer, Desha County, Arkansas. 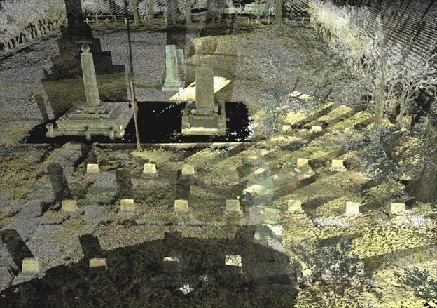 CAST performed a high-density survey (HDS) of the cemetery and the surrounding site using the Z+F 5006i scanner and the Leica C10 Scan Station scanner. In addition, the Center applied GIS methods to aid in the assessment of the current condition of the landscape and to globally locate significant features on the site. Finally, CAST utilized photogrammetric techniques to examine very low-relief art work that was discovered on a deteriorating bench located near the gravestones. CAST’s involvement was made possible through equipment and funding provided by the National Science Foundation (NSF) awarded CI-TRAIN project, Grant 0918970. For more information, please visit the project page here.